Today was actually quite good. Due to yesterday’s terrible experience with that tuk-tuk driver and my miserable room (which I totally brought upon myself, I admit), I was ready to hate Vientiane. I left the guesthouse last night, and hailed a tuktuk to take me to that tourist area, to look for guesthouses. I was dead set on moving to a better guesthouse on Saturday, when my two nights are finished in my current guesthouse. While walking around, I saw Vientiane’s Cafe Croissant D’or, the same cafe in Luang Prabang where I was supposed to have my last dinner (I ended up moving to a different restaurant because they don’t have steak that night, and I wanted steak). I decided to give it a try, and ordered a favorite: chicken cordon bleu. A cure for any bad day, I think, is good food. The chicken was bursting with flavor, and it does not have that weird cream sauce as it did in Luang Prabang at a different restaurant. It was easily the best meal I had in Laos (well, just next to that yummy street-side liempo). That eased my mood a bit, and after dinner, I walked around looking for an Internet shop. There weren’t any along Fa Ngum road that was still open at 7pm. I followed a tourist and came across one. The rate was the same as in Luang Prabang: 100 kip per minute. After 30 minutes online, I hailed a tuktuk and showed the driver the card with my guesthouse’s name and address. It’s no secret that tourists get charged a lot more than the locals do. I’ve made it a habit to ask before getting in, and saying “too much” quickly became automatic when the driver gives a price. The driver quoted 20,000 kip for the ride, but when I said too much, he tried to reason that it’s already a fair price. I wasn’t giving in, and he sighed and relented to the 15,000 kip fare (which is what I paid for the ride coming to this area). While I’m usually happy to go back to my room to rest, I was dreading this one. I wasn’t really keen on my room. This room made me apprciate my room at Vilay, though the shower here was much more appreciated than the puny one I had at LP. I had a hard time falling asleep, partially due to my unease with the room and the fact that I pretty much slept through the whole ride from Luang Prabang. I kept on waking up in the middle of the night, and struggled to fall back asleep. But this is not uncommon, as I generally have a hard time falling asleep in unfamiliar places. My mood didn’t really improve when I woke up. I took a shower, then headed out with my laundry in tow to drop off at the nearby laundry place. I also took my laptop with me, since I thought I’d have brunch at that place across the street that offers wi-fi. However, on the way back from the laundry place, I passed by this Internet cafe, and decided to just use the facilities there. I checked my mail and sent off an e-mail, inquiring about room availability at the place where Ferdz stayed at when he was here last February. 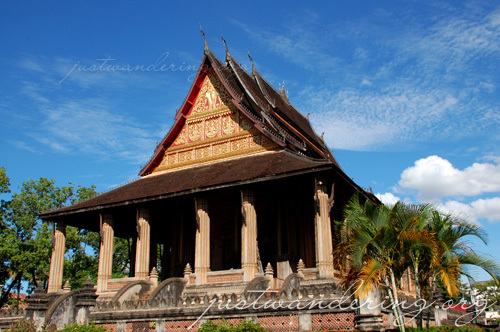 I also read about the places to see around Vientiene, and when I realized that there’e not much for me to do around here, I decided to just scrap the plan about taking the train to Bangkok and just buying a ticket on the bus and leaving at the soonest possible date. I walk back to the guesthouse to drop off my laptop, and as I walking back out, I saw a sign for the VIP bus to Bangkok. It terminates at Khao San Road, and though I want to stay else where when I go back to BKK, it will do. I ask the guy at the reception the details about the bus, and booked for Saturday night. The ticket cost me THB800 or 200,000 kip. It was a very touristy thing, but it’s cheap and it will take me out of Vientiane. My mood ligthened at that thought, and as I walked out, I felt slightly miffed because the weather outside was just gorgeous. It was as if it was giving me plenty of reason to love the place. I walked and walked, determined to find the Scandanavian Bakery that was always mentioned in Lonely Planet and Travelfish. I had the address, but as always, the tuktuk drivers cannot find it. The tuktuk driver dropped me off at the street where it was supposed to be, and I just walked since the road was already one-way going the other way. As I continue walking, I recognize some of the establishments along the road and realized it was where I was last night. It was surprising because I thought my guesthouse was too far from everything, where in fact, it was just a farther walk. I had lunch at Tex-Mex Alexia for brunch. Yup, another non-Lao restaurant. I am already in that phase where I’m starting to crave for food that I normally have, and starting to get homesick as well. It doesn’t help that when I logged into plurk earlier, most of the people in my timeline were plurking “happy independence day,” along with a screenshot of today’s Google doodle of the Philippine flag in celebration of the Philippine’s 111th independence. The restaurant certainly doesn’t serve Filipino food, but it does serve burritos and burritos make me happy. 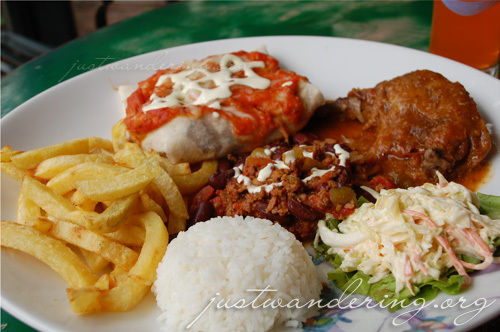 I ordered a set meal that comes with burrito, chili con carne, barbeque chicken, rice, coleslaw and french fries. While the burrito was a huge disappointment, the chili con was fantastic, and so is the chicken. It was a lovely brunch for 56,000 kip (drinks not included). While I was waiting for my meal, I took out the map I bought from the guesthouse (series 2006, an updated version from the 2004), and realized that most of the top attractions are within walking distance. With that, I started walking after my meal, making use of my umbrella to take off some of the heat from the midday sun. 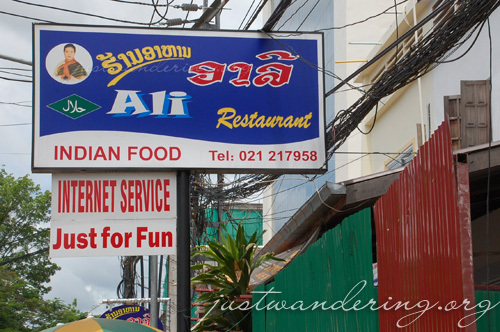 I came upon a row of Internet shops, and I ducked inside one to enjoy the airconditioning and to make reservations for my hostel in Bangkok. I contemplated staying at Shambara again, since the bus is terminating in Khao San Road, but I decided to just stay the whole four days in the Silom area, at a fairly new hostel. Hopefully, their wi-fi is working. I plan on doing some unplanned shopping, and close access to the BTS Skytrain is a clear advantage. Also, being rigth smack in the CBD means there are plenty of street stalls that Thai office workers frequented. 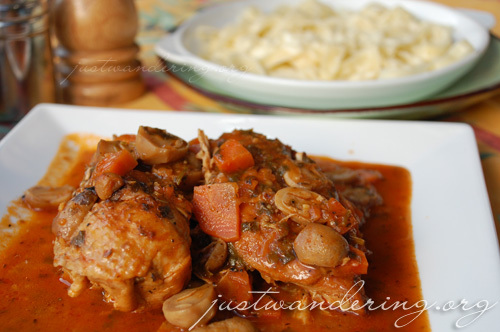 Great food for very cheap prices. After the short stop at the Internet shop, I had another longer stop at Joma Bakery Cafe. This is the same cafe that I loved in Luang Prabang, and I popped in for tea and a chocolate cream pie. Also, it’s a great place to pass the time as the mid day sun shines brightly outside. At 3:30pm, I decide to finally leave the airconditioned comfort of the cafe and headed out in the streets. I walk the lenght of Setthathirath road towards Ho Prakeo and Vat Sisaket. Both temples charge 5,000 kip admission each, and I just barely made it before it closed. Of the two, I liked Ho Prakeo better because it seemed more hospitable of the two. Unlike its namesake in Thailand, the former house of the Emerald Buddha is much understated. It’s a lovely place to just sit and meditate. 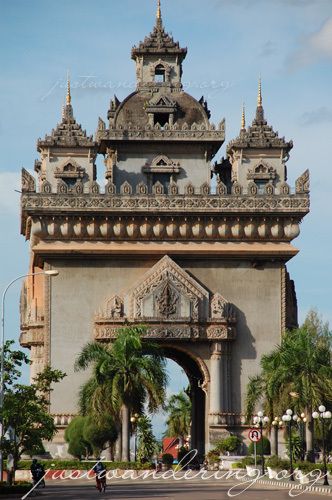 From Vat Sisaket, I walk down Lane Xang Avenue towards Patuxai, the Lao version of France’s Arc de Triumph. It was a walking distance from the guesthouses, but it can be quite tiring, specially if there’s no shade. I didn’t quite make it to the monument, primarily because I was afraid that there’s no traffic lights to help me cross the road. I walk back to Saylom road instead, to pass by the laundry, and I’m back here in my dingy room. Great site! Wow, a month-long backpacking trip across Asia – it must’ve been a great experience! I did two weeks in Cambodia and Vietnam this April and it was already amazing…imagine a month of that! We wanted to go to Laos too but didn’t have time. Maybe next year! And I’ll definitely look at your budget post about your Laos trip for reference. hi!!! ive been wanting to travel around asia but im pretty much scared to do it alone.. is it ok for a female to travel around alone?? 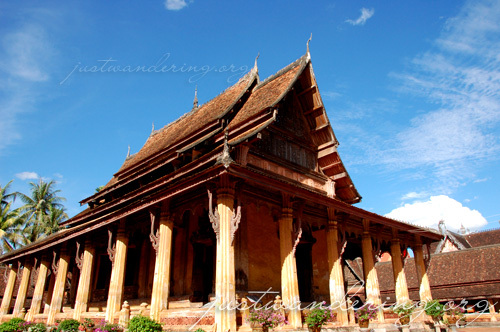 Ive been to hk and bkk and i wanted to travel to cambodia and laos. Do you have any tips coz im also in a budget and wanted to get travel this summer.